Everyone is talking about the latest episode in the Black Mirror anthology series, Bandersnatch, and with good reason; set in 1984, the interactive instalment puts you in control of key decisions throughout the film, meaning you can choose how the episode plays outs. Released on Netflix on December 28, Bandersnatch is a natural evolution of Black Mirror's paranoid depictions of technology – as well as Netflix's growing interest in interactive media on its streaming platform, such as Minecraft: Story Mode. It follows budding games designer Stefan Butler as he pitches his choose-your-own-adventure game, Bandersnatch, to games company, Tuckersoft. In typical Black Mirror fashion, no stone has been left unturned with the creation of a suitably retro-looking website for Tuckersoft, which features in the episode. 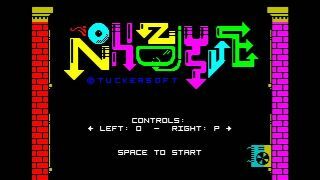 Not only that, but you can play one of the games from the episode, called Nohzdyve with the help of an ZX Spectrum emulator. A word of warning thought – it's best not to explore the site until you've watched the episode in case you inadvertently stumble across any spoilers. A still from Black Mirror's Bandersnatch on Netflix. How do I play Black Mirror's Nohzdyve game? What's interesting about the Tuckersoft website, is that there are multiple versions of it out there for you to explore, mirroring the different possible outcomes of Bandersnatch itself (spoilers ahead). The regular version of the website, which was discovered via a QR code in the episode, advertises Tuckersoft's games lineup, including Nohzdyve. However, on a different version of the website, which can be accessed by removing the 'www.' prefix from the URL, it states that the game was never completed due to a "bleak turn of events". Nohzdyve is a free falling game in which you need to avoid obstacles and collect eyeballs. To play the game, you'll need to head to the regular version of the website, and click on the download button to get the .tap file. As it's a .tap file, the game can only be played using a ZX spectrum emulator like Speccy (for the uninitiated, the ZX Spectrum was an 8-bit personal home computer released in the UK in the early 80s). Right now, it doesn't look like the title game, Bandersnatch, is available to play anywhere – but with multiple possible realities, it's probably only a matter of time before it's discovered on a similarly obscure website somewhere.